New day they say, come with fresh amazing opportunities and they day you see this can be your own. The founder of Information Guide in Nigeria, Mr. Ifiokobong Ibanga just launched a new multi-author blog, MySchoolNews.NG and he is calling on all bloggers to join in the participation. Like so many other initiatives, it is here to empower students and help them make money online while studying and unlike many others, it is 100% free to join. Your duty as a blogger is now to write a review of the new initiative, send the link to Mr. Ifiokobong Ibanga together with your account details and he will pay you straight N2,000. - You must write an original content, promoting the initiative. - Please let the blog admin approve you before you start writing, this is very important. - It must be a public blog, no PBNs, no forums. - The links you will give will be do-follow. If you are a blogger and interested, please contact Mr. Ifiokobong Ibanga on Facebook. What if you want to be a writer? 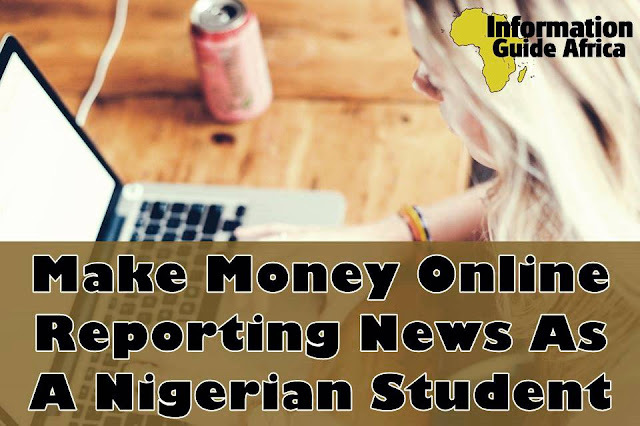 It is one of the awesome ways to make money online as a Nigerian student. You can now be a journalist, reporting happenings and events in the school environment and making your own money. You get paid N100 per article and the minimum payout is N5,000, which means that you can cashout directly into your Nigerian bank account once you publish 50 contents. Let me show you how to write for them. - Create an account on the site. - Sign into your account after that. - Upload a featured image if you have any. - Type in your article or paste from another source. - Make sure to include tags(labels), minimum 3. - Save your article as a draft. - Don't duplicate articles on the blog, whether yours or another persons. - Always include your name below each report. - Make sure you format your articles like a pro. We wish you goodluck! Please share to your friends.